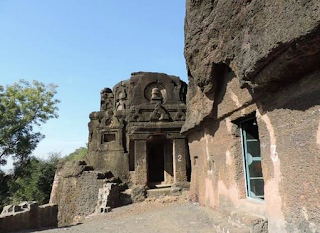 Kolvi Caves are located at Kolvi village in Jhalawar District of Rajastan. They are carved out in laterite rock hill. This Buddhist site has stupas, chaityas containing figures of Buddha. These caves prove that a flourishing Civilization existed here several centuries ago & under the Buddhist influence. The Kolvi village is situated about 90 kms. from Jhalawar. The only rock-cut caves in Rajasthan. The ancient Buddhist caves located in the village Kolvi are of great importance, both archaeologically as well as historically. A colossal figure of Buddha, the carved stupas are some of the highlights of these caves. Similar caves can also be found in nearby villages, which proves the existence of a flourishing civilization several centuries ago and the Buddhist influence in the region.